Helping you identify where you are – and where you should be heading. 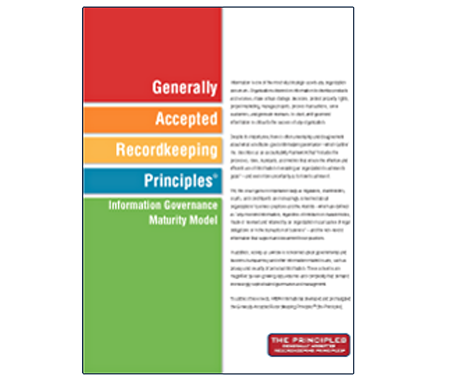 Assessing a company’s information governance standing. Celerity utilizes ARMA’s Information Governance Maturity Model to evaluate company recordkeeping performance and establish a realistic and defensible roadmap for improvement. Using this model, we conduct a series of interviews to ascertain current behavior and desired goals. We also discuss a range of possible tactics to improve the organization’s information governance standing. Based on this input, we provide a numeric performance grade and target, backed by qualitative findings and recommendations. Prioritizing multiple recordkeeping and IG initiatives to improve execution. Many organizations struggle with prioritizing numerous initiatives and mapping them to a strategic plan. Celerity assists by working with an internal team to define a best-fit set of criteria; evaluate initiatives against it, considering business need, resource availability, development time, cost constraints, dependencies, and risk reduction benefits; and publish a summary and detailed road map to serve as a clear guide forward. Our strategic guidance is supported by an array of tactical services aimed at improving information governance across the enterprise, from IT, to RIM, to Legal, to the varying Business groups.